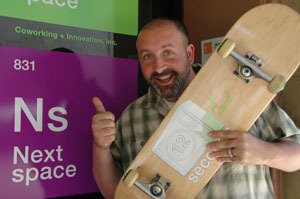 12seconds.tv founder Sol Lipman says NextSpace in downtown Santa Cruz is "a dorm for professionals." Photo by J. McNulty. Sol Lipman is a fun-loving guy. If you hear "high-tech entrepreneur" and think "boring," think again. Instead, think skateboards, summer camp, and pet chickens. Because fun is what it's all about, says Lipman, founder of 12seconds.tv, a web service that has popularized 12-second "video tweets" that users post to Facebook and Twitter. Why just 12 seconds? "We figured people make videos to be seen by their friends, and anything is interesting for 12 seconds," says Lipman. Although celebrities like Shaquille O'Neal and Imogen Heap have embraced 12seconds.tv, Lipman's real focus is on "building community," something he's pursued since college, when he spent two years as an RA in the dorms at Stevenson. "Our goal was to have the coolest dorms ever," recalls Lipman during an interview at the company's offices in downtown Santa Cruz. "We had something every week. Being an RA is still my favorite job of all time." Which is saying a lot from a guy who loved being a summer-camp counselor so much that he once took a detour off the high-tech highway to direct a summer camp. Whether in the dorms, as a founding member of the Stevenson Theater Guild, or in business, Lipman enjoys "being surrounded by great people who want to do good things." "I was the capitalist at UCSC," says Lipman, who graduated in 1995 with a degree in politics. "Everyone else wanted to protest that we couldn't be in a play because we weren't Theater Arts majors, and I said, 'Screw that, we'll just go and make our own theater troupe.' Whenever things don't go your way, there's an opportunity there. That's always true." Although a self-described "gadget person," Lipman says his interest in business drew him to Silicon Valley. His first Internet venture was a web development firm with Brant Smith, a former chair of the Student Union Assembly at UCSC. "That was so early, everything was wide open. We nailed it--we had big clients, like Hewlett Packard and Epson," he explained. "I learned a lot." That success bankrolled his involvement with one of the first social networking sites, which he describes as "scarily similar to MySpace but ahead of its time." The site, called thedigs.com, was acquired by IDrive during the dot-com boom. When the boom ended, Lipman decided he "really just wanted to be a camp director" and moved to Malibu. But "somewhere along the way," he was lured back into business, and he earned an M.B.A. from the University of Washington. "I was surrounded by executives from Boeing and Microsoft," Lipman says of graduate school. "I was shocked they let me in, actually. I think I was their token nonprofit (director)." When he was ready to settle down, the decision to return to Santa Cruz was a no-brainer: "Santa Cruz has got it all: amazing people, the beach, the mountains, and it's close enough to Silicon Valley to do another start-up." Which he did. Until it was acquired. And he found himself driving over the hill every day. Which got him thinking about what that commute over winding Highway 17 meant to his lifestyle. "Twenty-five thousand people commute every day from Santa Cruz to tech jobs over the hill," says Lipman. "Santa Cruz is a bedroom community for Google and Yahoo and Intel." Certain they weren't the only people disillusioned by the commute, Lipman and a friend organized "geek dinners" to talk about ways to develop local jobs. At the same time, city officials were talking about developing a co-working space in Santa Cruz. In October 2008, NextSpace was established. The hip, second-story space above a surf shop at the busy intersection of Pacific Avenue and Cooper Street in downtown Santa Cruz serves as a home base for 140 members, including businesses like 12seconds.tv, as well as independent contractors working in technology, design, public relations, architecture, law, and other fields. Options range from carrels where members can plug in a laptop to full-fledged office suites--and the café is always busy, says Lipman. "It's exactly the same dynamic as a dorm," he says. "It gets people out of their bedroom offices so they can come together and collaborate. It's a dorm for professionals." The success of NextSpace--open just a year, the facility is already maxed out--illustrates the pent-up demand for professional community in Santa Cruz, says Lipman. "It's all just a big lovefest, really," he says with a grin. Ironically, 12seconds.tv will likely outgrow its space, especially if 12mail, a new iPhone app, takes off. "That would be a sad day for us," concedes Lipman, who quickly adds: "But it'd be just like college. Eventually we had to leave."